Lucky Squire was born in 1898 in Budapest, Hungary and came to the United States as a young man during World War I. In his early days, he worked as a laborer and took any odd jobs to help his family settle into New York City. In the 1940s Squire became a minister. When his mustache started to turn white he let his beard grow out and it began to attract attention as he began to look like Santa Claus. 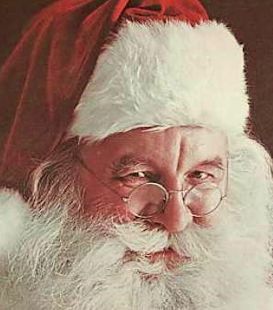 In the 1950s through the late 1970s, Squire was one of the most sought after Santas in America. He worked for over a decade as the Gimbles Department Store Santa in New York, appeared with the world famous Radio City Rockettes, and was featured in many print advertisements for many major companies from around the country. He is most known for his modeling work with Ideals Magazine and for RCA and Capital Records. His last modeling job was in 1979 for Sports Illustrated. Squire also did promotional appearances for major toy manufactures like Ideal and Mattel.